Aztec Religion was in essence a combination of astronomy and cosmology. Huge importance was given to the Sun, Moon and Venus by the Aztec people. The practice of this religion revolved around the Aztec calendar which had various festivals, rituals and sacrifices. All of the Aztec religious rituals would be headed by priests that performed in order to appease the gods. The Aztecs worshipped over a thousand gods, and each place in the Aztec world and each occupation had its own patron god. They even had gods for each day and also for each month. To appease the anger of the gods, human sacrifices were held for each god, in the hope of keeping retribution at bay. 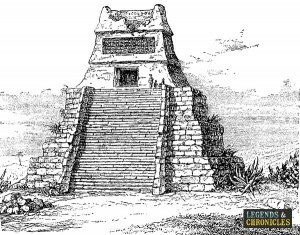 The most important Aztec gods even had their own temples at Tenochtitlan, the Aztec Capital. Most of the information that is available about Aztec Religion comes from the Spanish, who conquered them while documented the Aztecs and their religious practises in their native paintings called codices. There is also lots of archaeological findings, mostly found around The Templo Mayor that give evidence to their religious rituals that the Aztec people followed. Each level of society in the Aztec’s civilisation had its own god and rituals. An example was the feast of Huey Tozoztli, this feast was held in respect of this god of rain which favoured the farmers and was of course of great importance for crops. Then there is the Tlaxochimaco Festival which celebrates the god of Merchants. The Grandest ritual of all was the New Fire Ceremony which was held every 52 years and involved all the Aztec people. At this ritual, the high priest would sacrifice a person at the top of Mount Huixachtlan to the gods, and then light a fire on that person’s chest in dramatic fashion, signifying the importance of this sacrifice. The Aztec priest was called tlamacazui in Nahuatl language which means giver. The priests main role is to give the gods their appropriate offerings by leading the sacrifices and rituals. Due to the importance of religion in the Aztec civilization, priests were respected just like nobility and considered very important members of society. The priest did however had to live very religious lives that involved fasting and penances, and there are even times when they had to take some of their own blood during sacrificial rites. In contrast, there were also some religious personalities in the Aztec society that were not affiliated with priesthood. These figures were the black magicians, people who belong to occults, witchdoctors and the like. Aztec temples were basically large pyramids with flat tops, constructed by the Aztecs to offer up sacrifices to the gods and they were a very important part of the Aztec religion. The temples had small stone tables upon which sacrifices, mostly human, were made and offered. The base of the pyramid housed offerings or rooms for priests or sacrifices to stay. Modern excavations have revealed that the Aztecs built more and more lavish temples to honour the gods, and the common practice was to build on top of the old templates and extend them. Discoveries were made that showed that the Aztecs would build up to 6 layers on top of one original temple, with their obvious goal to be closer to the gods. The most important of the Aztec temples was found in the centre of Tenochtitlan and is known as the Great Temple. It was a double pyramid dedicated to 2 different gods. One was built for the god Huitzilopochtli and was led by the high priest Quetzalcoatl Totec Tlamacazqui, this temple was called Coatepetl which means snake mountain. The second temple was constructed for the god Tlaloc led by the high priest Quetzalcoatl Tllaloc Tlamacazqui. According to Aztec cosmology, the world is divided into three parts, heaven, the world they live in and the Land of the Dead. These three divisions were connected by the axis mundi represented on earth by the Templo Mayor. The forces of the sun and the moon, affecting the balance of nature and required balance. All aspect of human life activities were also influenced by religion including childbirth, agriculture, and the Aztec seasons. Aztec religion revolved around maintaining this balance to preserve life on earth and it was believed that the more offerings they give to their gods, the more the gods blessed their way of life and the anger of the gods would be avoided. 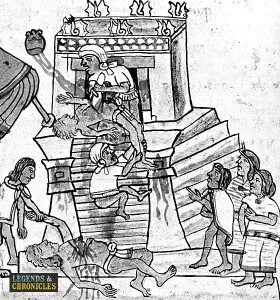 Thus, the Aztec people ensured that human sacrifices were done regularly and their offerings were scheduled around the Aztec calendar as each of the gods were given their own festival.